On 8th march 2016, like elsewhere in the world AISAT also witnessed the women’s day celebrations. The theme for the day was “Be bold for change “. All the women in the college were made to feel special as they were encouraged and motivated for all the sacrifices they had made for the betterment of others. To make this session more interactive and interesting one, the NSS members organised a women oriented quiz competition, where all women achievers were highlighted. The contestants included 2 members from each branch. The mechanical department headed the competition, by scoring 65 points. The winners were Pranav Menon and Roshan Francis Pious from S2 ME. The winners were awarded by the Assistant Manager AISAT, Rev. Fr. John Christopher. 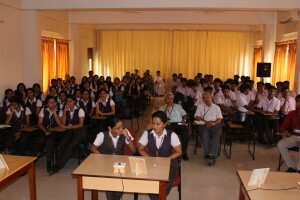 The prizes were sponsored by Faculty members from various departments. This one hour program extending from 3:45 to 4: 30 PM had been made productive by enhancing our knowledge on women oriented arena.